Reward yourself and your loved ones with probably the best vacation you can ever have – that is a great adventure waiting for you in Palawan Island, Philippines. It’s the dream getaway all nature lovers can ever ask for – stunning white beaches, ancient caves, premiere diving spots, sublime waterfalls, amazing rain forest, captivating mountains, etc. – truly a sanctuary of the world’s greatest treasures! #1 - El Nido Resorts Pangulasian Island: Burst with gladness at El Nido Resorts Pangulasian Island, a gem in Bacuit Bay, El Nido, Palawan Island! It is without question, outstanding for their customer service, amenities, food, ambiance, beach front, need we say more? No doubt, all its guests would possibly live in this island if they had that chance of a life time, what with their accolade attributable to how this resort’s staff and owner would exceed your expectations and provide you with loads of enjoyable activities that absolutely please, even the most discriminating tourists. #2 - Qi Palawan: Customer satisfaction is the key, at Qi Palawan –located at Sitio Palabuyan, San Fernando, El Nido, Palawan Island. An extensively commendable staff, management, cottages, bathroom, furniture, bed, free Wifi, mouth-watering food, massage, quiet beach, pool, and so on… await every tired guest looking for serenity, excitement and rest that are indeed the best. Most of its visitors wish to extend their stay in Qi Palawan, where they never regret giving in to their urge to splurge. 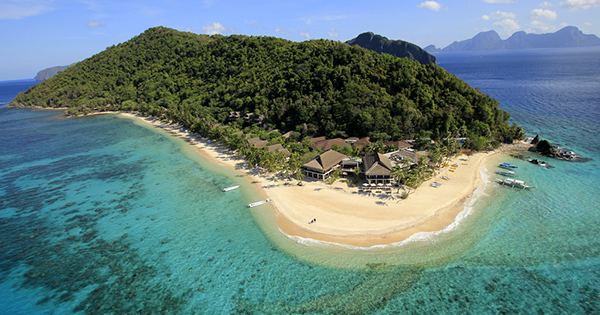 #3 - El Nido Resorts Apulit Island: One can’t get enough of El Nido Resorts Apulit Island – situated in Apulit Island, Taytay, Palawan Island. This superb beach resort absolutely has the X factor for every thrill-seeking visitor – with their great amenities, water sports, yummy dishes, sparkling ocean, hospitable staff, assistance for hiking a mountain, island hopping, etc. El Nido Resorts Apulit Island has got tons of rave reviews – you will definitely be the next one to enlist your memories of incredible fun from this spectacular island! #4 - Daluyon Beach and Mountain Resort: Fall in love at first sight with Daluyon Beach and Mountain Resort – another Philippine treasure in Sabang Beach, Sabang, Palawan Island. An ideal place for lovers, families or solo travelers, one can expect amazing beach view from their rooms, the unforgettable experience to visit the Underground River, delicious breakfast buffet, very gracious and helpful staff, along with all the peace and quiet you have been looking for, away from all the hustle and bustle of your daily grind. #5 - Busuanga Bay Lodge: Don’t be blue, there’s love that’s true from Busuanga Bay Lodge –a soothing haven at Sito Lawi, Concepcion, Palawan Island. This awesome resort will pamper you with their amazing and friendly staff, marvelous amenities such as their infinity pool, sumptuous breakfast, very clean rooms, awesome beds, enjoyable water activities, heavenly scenery, bar, café, and villa-type architecture, that promises to give you the privacy you need in lovely Busuanga Bay Lodge.